Anomie refers to a condition or malaise in individuals, characterized by an absence or diminution of norms (standards) or values—a state of "normlessness" which leads to feelings of alienation and lack of purpose. Emile Durkheim invoked this concept in his account of the causes of suicide. He suggested that people need standards by which to live their lives. This allows them to achieve recognizable success by setting commonly valued goals that have socially acceptable means by which they can be achieved. When such standards are lost, socially recognizable success becomes impossible and people feel that their lives are futile. Thus, instead of liberating people, the removal of social norms actually imprisons individuals in meaningless existence. Communities of shared values and standards of behavior are essential to avoid such a state of anomie and maintain our psychological health. The word anomie comes from Greek, namely the prefix a-: "without," and nomos: "law." The contemporary English understanding of the word anomie can accept greater flexibility in the word "norm," and some have used the term "normlessness" to reflect a similar situation to the idea of anarchy. However, as used by Emile Durkheim and later sociologists, anomie refers to a situation in which there is a loss of the regulatory social controls of society, and thus is a completely separate concept from a situation of anarchy, which is an absence of effective rulers or leaders. The economist Friedrich Hayek also used the word anomy with Durkheim's definition. The primary use of the word anomie is a social condition characterized by instability, the breakdown of social norms, institutional disorganization, and a separation between socially accepted goals and the available means for achieving them. Individuals living in a society in which this state of normlessness exists often experience alienation from other people and a loss of purpose in their lives. The nineteenth century French sociologist Émile Durkheim used this concept in his book Suicide (1897). He outlined the causes of suicide, describing a condition characterized by an absence or diminution of standards or norms (referred to as normlessness), and an associated feeling of alienation and purposelessness. He believed that anomie is common when the surrounding society has undergone significant changes in its economic fortunes, whether for better or for worse and, more generally, when there is a significant discrepancy between the ideological theories and values commonly professed and what is actually achievable in everyday life. In other words, Durkheim argued that while societal norms and regulations may appear to limit the behavior of individuals, a lack of norms, allowing individuals the freedom to do absolutely anything, actually traps them in a situation where success is impossible. When there is no agreed upon definition of desirable goals or acceptable ways in which to achieve those goals, there is also no way to achieve success. Facing such an empty existence, devoid of purpose, people are likely to contemplate suicide as a means to end their futile, pointless lives. Robert K. Merton adopted the idea of anomie in developing "Strain Theory," defining it as the discrepancy between common social goals and the legitimate means to attain those goals. In other words, an individual suffering from anomie would strive to attain the common goals of a specific society, yet would not be able to reach those goals legitimately because of the limitations in the social structure of their society. As a result, the individual would exhibit deviant behavior ranging from rebellion, delinquency, crime, and ultimately to suicide. The innovator adopts means deemed unacceptable by society some of which may be criminal (for example, theft) to realize success. The ritualist follows the rules obsessively but loses sight of the overall goals (for example, the inflexible bureaucrat). The retreatist abandons both goals and the means to achieve them (for example, the alcoholic or drug addict). The rebel rejects both the traditional goals and means, but envisions new ones as the basis for a new social order, an extreme example would be the terrorist. Therefore, the conformist internalizes the common success goals but also has access to the approved means to realize these goals. For the other relationships, a condition of goals—means dysjunction exists. 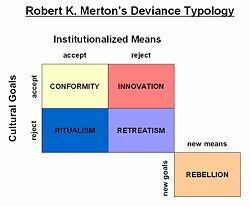 Thus, Merton saw deviance not in terms of personality types, but as role responses to different forms of dysjunction between goals and means to achieve them. According to Merton's analysis, deviance is not created by deliberate intent on the part of the actors, but rather is a response to a breakdown between universal expectations (to be successful) and the availability of approved methods to achieve those ends. Or, as Merton expressed, when a society professes that every office boy can become president but the avenues to such aspirations are socially limited, the stage is set for deviance on a broad scale. Anomie has also been used to refer to the psychological state of individuals who experience a personal state of isolation and anxiety due to their perceived lack of purpose. In this usage, a person suffering anomie has lost all personal sense of social obligation, or trust in others as supportive or concerned about their welfare. Such a state of mind renders the individual incapable of forming close bonds with others and sharing goals and acceptable means of attaining them. Thus, their isolation increases. Such individuals suffer anxiety, feelings of futility and purposelessness, becoming amoral and disconnected from the social norms of others around them. Fyodor Dostoevsky, whose work may be considered a philosophical precursor to existentialism, often expressed a similar concern in his novels. In The Brothers Karamazov, the character Dmitri Karamazov asks his atheist friend, "...without God and immortal life? All things are lawful then, they can do what they like?" Raskolnikov, the anti-hero of Dostoevsky's novel Crime and Punishment, puts this philosophy into action when he kills an elderly pawnbroker and her sister, later rationalizing this act to himself with the words, "...it wasn't a human being I killed, it was a principle!" In film, the protagonist of Martin Scorsese's Taxi Driver could be said to suffer from anomie. Durkheim was generally optimistic that changes in the structure of society due to division of labor would lead to positive developments for both society and the individuals in that society. However, he also noted that such changes might produce a state of confusion with regard to norms and increasing impersonality in social life, leading eventually to the breakdown of the norms regulating behavior. As societies become more technically proficient and careers more specialized, individuals inevitably become more alienated from their fellow citizens. Little common ground exists between investment bankers and street cleaners, making both feel isolated within their existing social circles. Anomie is an accurate term to describe this division. Durkheim suggested that the problem of anomie could be overcome through social associations based on professions that would socialize with one another. He believed this would give people a sense of belonging, vital to preventing anomie. In his study, Suicide, Durkheim showed that Catholics committed suicide less often than Protestants because of the sense of community developed within Catholic churches. Thus he advocated the importance of communities within the larger society, through which people can share common values and standards of behavior and success, and so avoid feelings of isolation and the development of anomie. This page was last modified on 1 April 2016, at 21:32.